I love Chicago’s love for food and that summer doesn’t stop people from getting their ramen. At least not at Furious Spoon! I went to one of their seven locations in Logan Square for dinner this month, and had the most wonderful experience. It was a rainy day when I visited and the one time I actually hoped for rain, because you know like I do, that rain is the perfect setting for a piping hot bowl of ramen. Moreover, this Tokyo-style eatery provides the coolest, hip ambiance for your noodle indulgence. Beautiful, colorful graffiti walls, dim lighting, and groovy hip-hop tunes is what you’ll find at any Furious Spoon in the city. The menu is succinct and there’s just enough to keep it easy with the decision making but satisfy everybody. 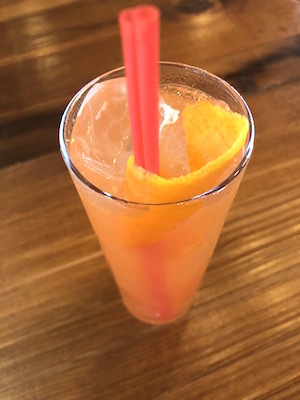 Signature drinks are fun twists on classics with cool names, such as the Tai Me Down and Nuthin’ But A Gin Thang. Gin and tonic never tasted better, with a little help from fresh mint and lime. Sake lovers, you’re covered too. The Takoyaki is one of the best in the city and can be ordered 3 or 6 pieces. These dough balls were decent-sized with fresh pieces of octopus, drizzled with a sweet Takoyaki sauce and covered with large bonito flakes. Found my new snack favorite! Although it will compete closely with the Lime Togarashi Edamame on their menu. Another addictive dish. I ordered two bowls of ramen, the Vegetable one with broth and the Masaman Bowl with Shrimp Tempura, without. Did you know that you can now order any ramen brothless? Just like their hashtag reads, #FreetheNoods. Love it! My fellow veggie lovers, the Vegetable Ramen is no less furious. That veggie-miso broth with roasted garlic, cabbage and kikurage mushrooms will make you forget all about the meat. I highly recommend getting the fried tofu and egg as your garnish. Note that the bowls can easily be shared by two. No surprise that the Summer Mazemen Bowl with shrimp tempura one was my favorite dishes that evening. The noodles were cooked in a lip-smacking Japanese honey-mustard sauce with a sesame-infused vinaigrette, and those fritters magically stayed crispy the whole time. Do not miss this! I finished the meal with an Ahi-Tuna Poke Bowl. Who knew they also had poke?! The bowl came loaded with fresh tuna and big portions of veggies like red cabbage, which I love with fish. Colorful, light, refreshing, healthy; I’m running out of adjectives but you get the point. Basically your favorite sushi rolls in a bowl! Furious Spoon doesn’t do dessert but they sell Pocky, which is a Japanese biscuit snack in both chocolate and Matcha flavors. That’s a win for me. You’ve got to stop in to a Furious Spoon soon. It’s casual, fast, affordable and utterly delicious. In and out with a very happy belly, I promise. East Coast met the Midwest at The Hampton Social’s new Streeterville location’s grand-opening this month. What an extravagant party, well-planned from start to finish. This nautical-themed joint is restaurateur Brad Parker’s creation and vision brought to life and now with almost five locations. The restaurant was abuzz with unlimited frose flowing, as I found my favorite cocktail for next summer (since this one’s coming to an end). The Sea of Lavender with Hangar One rose, vodka, lemon and lavender won’t leave my hands the next time its warm, I can assure you that. 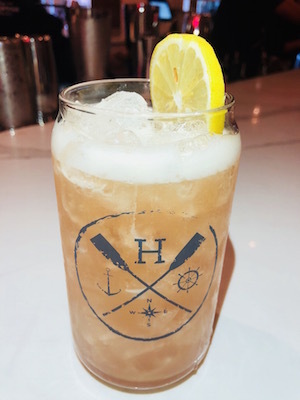 Their Passionate Mojito is a product of my favorite Plantation 3 star rum concocted with Giffard passion fruit, lime, and mint, and was another favorite for me at the event. 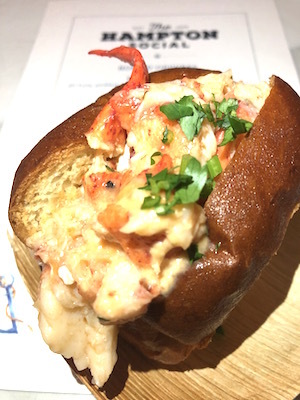 For food, guests sampled a variety of hors d’oeurves from Deviled Eggs, Mini Lobster Rolls, Avocado Toast, Brussel Sprouts, Burgers, and Shrimp Tacos. As you can tell, there was no dearth of seafood for this pescetarian guest. Everything was visually tempting and also intensely delicious. The second floor has an outdoor patio you just cannot miss and guests (including myself) partook in Prosecco Pong and a few games of bags. Hey, this is one way to fight the end of summer. They just wont have it at the Hampton Social. I have never not had a fun time at the Hampton Social but now I just get to hop from one location to another within a mile of each other. I’ll always advocate for more Hampton Socials opening up. A true lifestyle-based concept with exceptional cocktails, food, and vibe and a stellar crowd always. Hope you get to stop in and check out their new location soon! You get what you give, in this case drive. 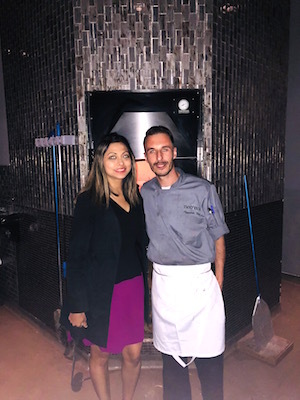 I drove on a school night to Neoteca in Barrington for dinner recently, and by the end of the meal had forgotten just how far I had driven, because the food was that good. 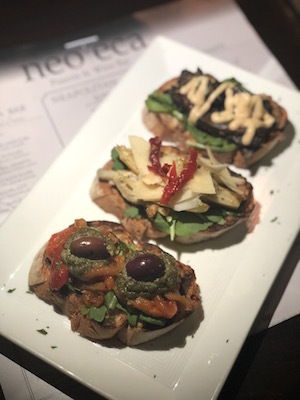 Neoteca is a pizza and wine bar with modern design, a cheese and salumi bar, fabulous Italian artwork and great beats pumping throughout. The restaurant has been making quite the strides in the neighborhood since its opening in 2016, with lines out the door on the weekends. I just had to find out what the hype was about, and merrily accepted Chef Timmy Saljihi’s invitation to go in for a menu tasting. I’ll just say; best decision ever! After a long day and a long drive, the Limoncello Martini sounded like the drink of choice. A simple blend of Limoncello, crop citrus vodka and sugar, but such a refreshing treat. And that’s when it started to happen. Chef started sending out his favorites and they never stopped. Hospitality is an understatement here. First was a cheese platter with everyconceivable cheese, from parma regio, white cheddar to pecorino all served in the most eye-pleasing presentation of olives, grapes and bread. I started devouring this only to realize that this was only one of many and it was time to slow down. I also forgot to mention the Bruschetta section of the menu where patrons can order three different kinds of bruschetta only for $11. It doesn’t get more reasonable than that. We sampled six; the Eggplant, Roasted Peppers, Speck & Cheese, Whipped Ricotta, Artichoke Hearts and, no surprise but my favorite, the Smoked Salmon. What a unique combination of salmon, pesto capers, red onions and feta. These bites were also a great way to jumpstart my appetite for the larger items to come. The Calamari Fritto was a large plate of lightly battered calamari with fried banana peppers mixed in. The tangy and mildly spicy taste of the peppers with the calamari was so, so wonderful. I wish more places would serve Calamari this way. Given Chef’s Greek background, I could only imagine how delicious the Persian Feta could be. So I asked to try it and it was as delicious as I had imagined. A small jar with creamy herd-infused feta was served with buttery crostini on the side. I really enjoyed this dish. I was particularly impressed that Chef serves a Polpetti Veggie for vegetarian lovers who look longingly at meatballs but can’t indulge. Three large homemade vegetarian balls were served atop a sweet marinara sauce. Mind you, these were filling but addictive nevertheless. We saved the pizza for the last and got to try the Caprese Pizza on special that night. Knowing that everything is made from scratch in this pie, dough that was kneaded seven hours ago, freshly prepared sauce, and giant basil leaves placed neatly on a milky mozzarella. Basically everything you love about Caprese salad as a pizza. Made me feel like summer wasn’t over after all. 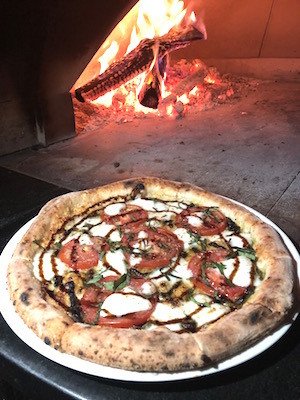 The menu at Neoteca is varied although with a pizza focus, and I can see why now. Do not miss their pizza when you’re there! With all these classics, the Tiramisu just made sense to order. And this custard-layered cake was as amazing as everything else I had eaten. The strong coffee flavors helped my food coma enough to be able to make the drive home. Neoteca is another great find for me this month. And this is why my quest for food never stops! 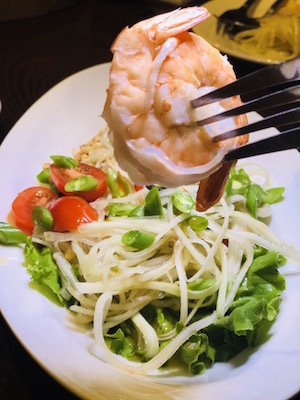 If you’re looking for a true cross-cultural experience where dining is easy and enjoyable, you must Amarit Thai located in the South Loop. My pride knows no bounds when I discover more amazing places in my neighborhood. Amarit is another gem that I’ve discovered and had the pleasure of visiting recently. Their décor is cute with lots of Thai artwork to add to the authenticity. My guest and I decided to indulge in a few cocktails and started with the Mai Tai and the Blackberry Smash. Both made a great first impression for the meal that was about to unfold. On a rainy day, steamed Shrimp Shumai sounded perfect. These were perfectly folded tender wontons served with a delicious garlic and soy sauce. I couldn’t stop eating these, but you can’t blame me! The Fried Tofu came a soy bean curd cake deep-fried golden brown, with a delectable peanut plum sauce for dipping. I lost count with these too. 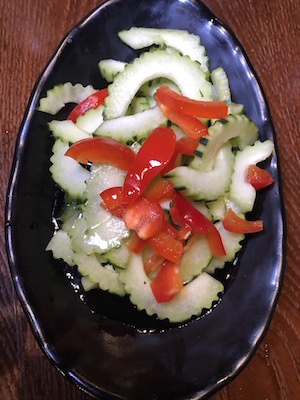 Salads are always a good transition from heavy appetizers so we asked to try the Som Turn (Green Papaya Salad) and the Ajard (Cucumber Salad). Both were unique; although I loved the boiled shrimp garnish in the former and mild sweet and sour onion dressing in the latter. 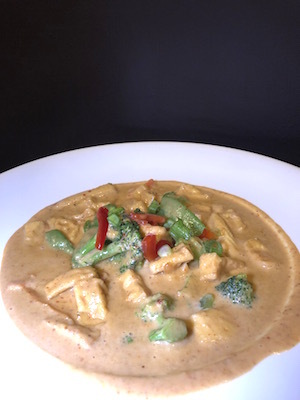 Having revitalized with fresh greens, we had our sleeves rolled up for some tantalizing curries. We asked for the Masaman Curry with Tofu, and the Sole Lime. The classic Masaman did not disappoint and I was particularly taken at its perfectly thick consistency. The Sole Lime was a favorite from the night. Steamed sole fish cooked in a ginger, lemongrass, green onion, cilantro, and lime broth. If you’re looking to clear your sinuses, this dish has all the good stuff that will do that. What a simple dish with amazingly complex flavors. Big portion too! For mixing, we ordered the Crab Meat Fried Rice which was generously strewn in with sweet crab, egg and onion. This is the combination you should get when you’re there, and then thank me later. How could I not try their maki?! I’m impressed at Thai restaurants that offer sushi and do it well. And I always appreciate the opportunity to diversify my palette during a meal, and Amarit allowed me to do that with some of the best maki in town. 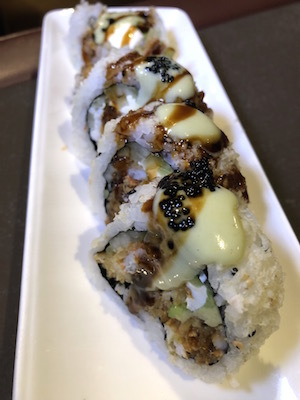 My recommendation would be the, Printer Row which came with soft-shell crab tempura, unagi, avocado, cream cheese, tempura crumbs and wasabi mayo. My friend ordered the Avocado Roll from the vegetarian maki section on their menu and seemed quite impressed too. Hooray for my vegetarian friends! I can’t rave enough about Amarit. Such great flavors in everything they put out and with a pleasing presentation too. A short walk from my home too so this could be dangerous. 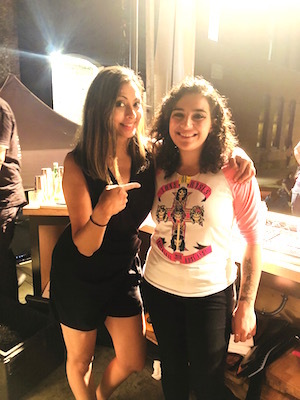 This month I really stepped out of my comfort zone as I got picked to participate in the first ever Speed Rack Harvest Fest Edition at Fulton Market in the West Loop. 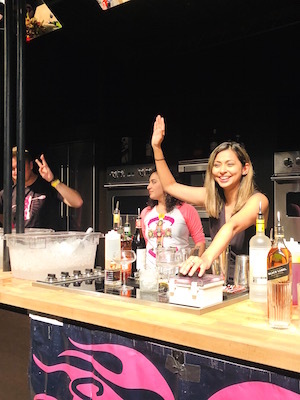 This national cocktail competition has top bartenders compete in cocktail making in a round robin style timed event with 100% of proceeds from the events going to breast cancer education and prevention. Bartending and drinking for a good cause is something I can get behind. So I agreed to do it. Little did I know what it entailed! I walked on stage with a huge crowd and blaring lights and all the cocktail paraphernalia, except I have never made a drink in my life. I’ve poured myself wine and mixed rum and coke but that’s about it. I can’t say I wasn’t daunted and immediately nervous about making a fool of myself on stage. To top that, we were being judged by Phil Vettel, Chef Sarah Grueneberg and Chef Stephanie Izzard. You can imagine my dismay. Luckily, we were each assigned a Speed Rack Champs our helper throughout the competition so there was help. And I was also fortunate that the three other food bloggers participating are my good friends. For the first round, I went up against one of them and as soon as the buzzer went off, we got to work. Now, my competitive spirit had been fired up and there was no stopping me. I stirred and strained as I made three of the requested drinks, Manhattan, Negroni and a Margarita, and won the first round! And now I just ay have a second career in bartending. Many rounds later, I was the second runner-up and glad that the winner Sam, for to give a $1000 to a charity of his choice. Such a neat way to drum up some excitement and raise money for a good cause. We need more events like this in the city. And yes, afterwards I did sample the drinks. I needed a few after that fiery contest. So worth it though! Do you know that this boutique seafood shop specializes only in flash frozen canned food? 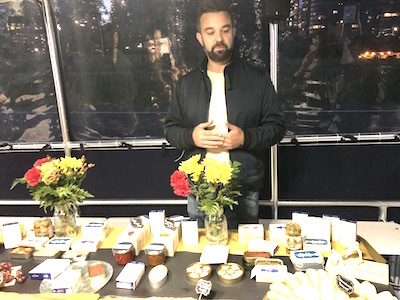 I will be the first to admit that canned seafood didn’t really have much appeal to me, that is until I went on a cruise with the nice people at Winter Market one evening, this month. That’s were I got to sample some of the best tinned and smoked fish from around the world and it changed me forever. The lure for me was also that all product is sustainably caught and harvested, and no hormones or preservatives, ever. 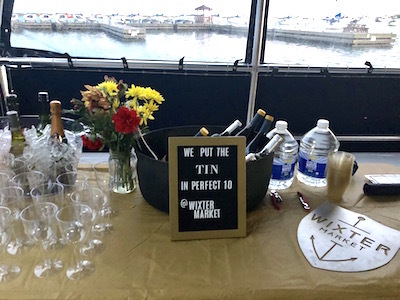 We sipped on some Rose as we cruised along the lake and river and sampled everything from smoked trout, smoked salmon, octopus, calamari, sardines and anchovies. With that there was bread and some fine cheese and preserves. I also want to mention that all the conservas were flavored and seasoned so if raw fish isn’t your thing, you’ll love this! I’d say push the envelope and explore the possibilities of canned seafood, you could be pleasantly surprised!